If you visit this route during your holiday in Gudauri, your remaining days at the resort will find you basking in genuine respect with the title of a real expert, with all paths pointing to the lines that you skied the day before. The mountains of Shele and Miketi are clearly visible from any point at the Gudauri Ski Resort; they look like giant, steep walls. In fact, their steepness does not exceed 35º and the only reasons not to explore this area are increased avalanche danger or limitations in your mountain experience, physical capabilities, or stamina - the ascent to Miketi mountain takes at least 4 hours. The vast snowfields of Shele and the giant ridges of Miketi form an opportunity to leave your epic line on untouched powder - the dream of every freerider. There is a high probability that the descent on this route may be the best descent of your winter. Moreover, these sites inspired the Russian writer M. Lermontov to write the story "Demon" during his exile in Tbilisi. The route starts from the gorge and consists of two relative parts – an ascent to the first ridge with exit to a hidden valley and an ascent from a hidden valley to the top of the Shele or Miketi mountains. The terrain is open and predictable. The steepness of the slopes averages an angle of 30º, and there is an absence of big terrain traps and sudden drops. Views throughout the route and from its uppermost points are some of the most iconic and memorable in the region. Shele is very popular with heli-ski companies operating in Gudauri. So, if you go on a route without a guide, coordinate the time and details of the route with the heli-ski companies by clicking here: http://heliski.travel/. Otherwise, heli-ski groups on descent can create a significant danger for freeriders ascending from the gorge. At the beginning of the route there is a small stream that can be crossed with stepping stones. However, during warm weather and precipitation, the stream overflows and it is difficult to pass it without getting your feet wet. In this case, you can cover your feet with simple plastic bags bought in any Gudauri store in advance. Heading off for this route is possible only in conditions of good visibility and a favorable forecast. In conditions of poor visibility ("white out weather"), you can easily lose visual landmarks and get lost. 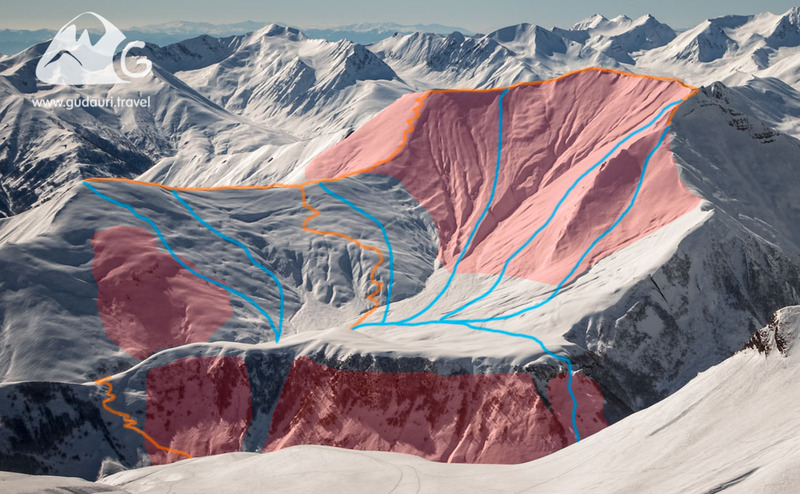 Steep and avalanche areas (marked in red on the map) must be passed at a distance from each other. Check the level of avalanche danger before setting off for the route! Daily updated information on the level of avalanche danger can be found in Gudauri Travel Bar (www.gudauri.bar). Ski touring / splitboard set., Ski crampons. The route starts from the uninhabited village of Guda in the Aragvi gorge, located by a 40-minute drive from the resort. You can get there by car (only off-road vehicle). The first 15 minutes the road goes along the highway, in the direction of Tbilisi. On the third turn of the serpentine road, there will be an automobile exit to the right (gravel road), which continues along the bottom of the Aragvi gorge. In 20-30 minutes, you will arrive. On the left, there will be a steep hill topped by the ruins of an old fortress (Gudala Castle, in the story of M. Lermontov "Demon") – this is a good landmark for stopping. At the foot of the hill there is a stream, which is in fact the famous Aragvi River. These days, the majority of the water flow is enclosed in underground pipes that lead to a modern hydroelectric power station, visible from the beginning of the road to the gorge. You’ll encounter the smell of sulfur in this area. You can return to the resort by taxi. Throughout the route there is a mobile network. Call the driver when you’re about 40 minutes from the end of the route so that he can meet you in time. The standard cost of a 7-seat car to drop you to the beginning of this route and pick you up after descent is 150 GEL. In 100 meters after the beginning of the route from the car you need to cross the stream. Further, the ascent continues towards the saddle on the first small ridge visible from here. In less than an hour you will be on the saddle. From here continue to the right, bypassing the ridge on your left side. Thus, in 20 minutes you will find yourself in a hidden wide valley, which is not visible neither from the beginning of the ascent, nor from Gudauri. When crossing the valley, you will approach the foot of the second main ridge. From here, climb the part of the ridge the is the least steep, between the tops of Shele (left) and Miketi (right). On the ridge, depending on the level of snow cover and avalanche danger, and also taking into account your capabilities, you can then decide which peak to climb - the simple one on the left (Mount Shele) or to the more complex one on the right (Miketi). The descent from all peaks is to the same inner valley. You can descend along the same path of ascent, or if there is sufficient snow cover, along a large steep slope with northern exposure, further crossing the stream across the bridge located next to another uninhabited village. For experienced skiers. Backcountry experience at least five years.